Online Store Web Site Map F.A.Q. The 150 amp. welder depicted on this page is powered by a Briggs & Stratton 11 HP electric-start lawnmower engine (with internal alternator for battery charging) which was used in a Murray riding lawn mower. The lawn mower's deck and transmission were worn out, but the engine was in good shape. 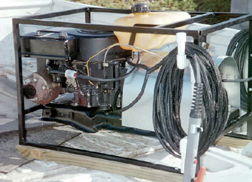 To make the installation simple, the owner used the mower's existing steel floor/frame plate, to which the mower engine was already attached, as the mounting mechanism for the welding power generator as well (see side views). 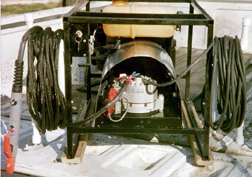 All that had to be done was to cut a hole to accommodate the power generator's pulley and fan and drill a couple of holes to rigidly mount the power generator to the floor plate. V-belt tension is adjusted by means of an idler pulley which was used in the mower. 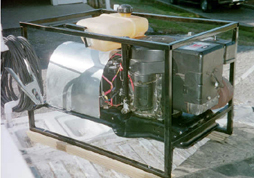 A piece of sheet metal was used to provide a bit of protection from the elements to the welding power generator and battery -- and to dress up the completed unit. The well satisfied owner reports that this weekend project was completed on schedule -- and that the total cost of his finished welder was less than $700. He also plans to add an external voltage regulator and use the unit for quick charging batteries. To insure proper welder operation with this motor, a second flywheel (obtained from the "bone yard" at a local mower repair shop) was attached to the bottom of the mower engine. Without this extra flywheel mass, welding would cause the engine speed to decrease, and the engine to labor to an unacceptable degree. ZENA is a trademark owned by ZENA, Inc. for its welding systems and related products. © Copyright 2001 by ZENA, Incorporated. All rights reserved.